In my previous blog I found Rig EK via RoughTed malvertising operation. 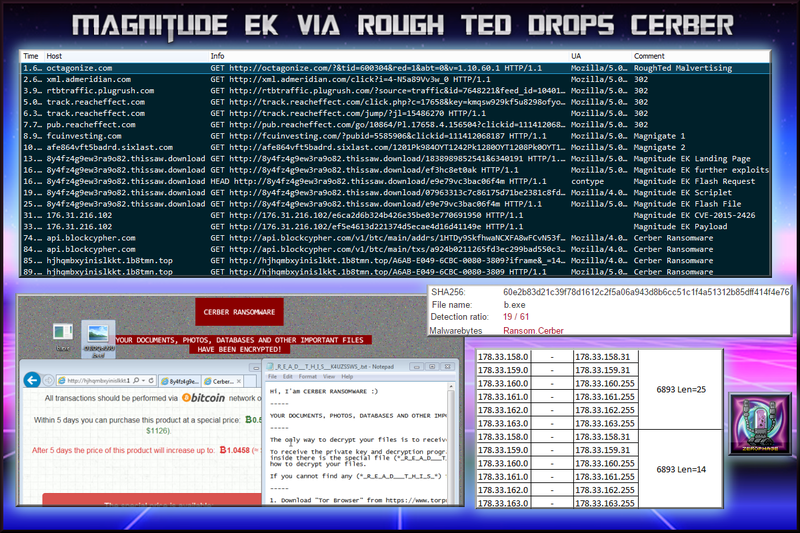 I saw in the MalwareBytes article that it also redirected to Magnitude EK. Curious to find it, I set my lab up for Magnitude and went to find it. It only took about 5 minutes. I wonder what else RoughTed leads to apart from that which has been listed. A few previous Magnitude EK posts from me. 31-May-2017-Magnitude-Cerber-CSV – CSV of traffic with resolved IP addresses. This flow began with “RoughTed”. This is a malvertising operation reported on by MalwareBytes recently. Other than the initial starting point, everything else seemed fairly normal. This time though I had a double landing page which opened in a separate window. I did only saw Powershell commands in processes for both “a.exe” an “b.exe“. I this flow, “b.exe” was downloaded successfully and ran which I have not seen before. The Scriptlet also failed to create a failed payload. Below is a screenshot of what happens when the Flash File runs. 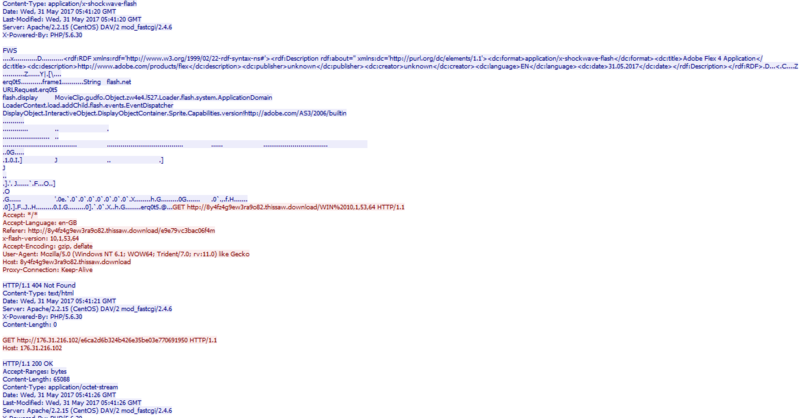 It appears to generate a URL that is met with a 404 however another URL is requested to download a payload that exploits CVE-2015-2426 and in this case allows Magnitude to run Powershell commands which were successful. I only noticed one change in this Cerber and that was the ransom note said (and no typo) “Hi, I’am CERBER RANSOMWARE :)” which I’m fairly sure I have not seen before.